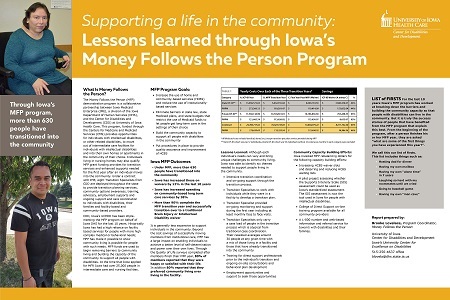 The Money Follows the Person (MFP) demonstration program is a collaborative partnership between DHS’s Iowa Medicaid Enterprise (IME) and the Center for Disabilities and Development (CDD). 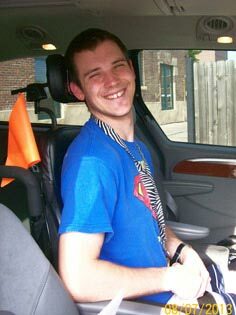 This program, funded through the Centers for Medicare and Medicaid Services (CMS) provides opportunities for individuals with intellectual disabilities, or other related disabilities, to move out of intermediate care facilities for individuals with intellectual disabilities and nursing homes, and into their own homes or apartments in the community of their choice. Individuals living in nursing homes may also qualify. MFP grant funding (which CDD worked with the IME to obtain) provides for transition services and enhanced supports needed for the first year after an individual moves into the community. In addition, CDD employs an Employment Specialist to address employment barriers faced by MFP participants, and two Behavioral Specialists to provide training and consultation to providers, consumers and families, who are assisting a person that may be experiencing challenging behaviors. Learn more at: Positive Behavioral Supports Training. Hello, It’s Us: Perspectives on Inclusion is a public access television program, produced in Iowa City by the Center for Disabilities and Development. The co-hosts, who both have significant disabilities, use public access television and YouTube as venues to highlight a variety of disability issues, including legislation and policy, through the lens of inclusion. Use the links below to watch a two-part episode that focuses on the Money Follows the Person program. All Hello, It's Us! episodes are available on the Hello, It's Us! YouTube Channel. At the 2017 annual conference for the Association of University Centers on Disabilities, Iowa's UCED presented this poster. The poster includes program goals and lessons learned, and it provides an update on Iowa MFP outcomes since the program began. 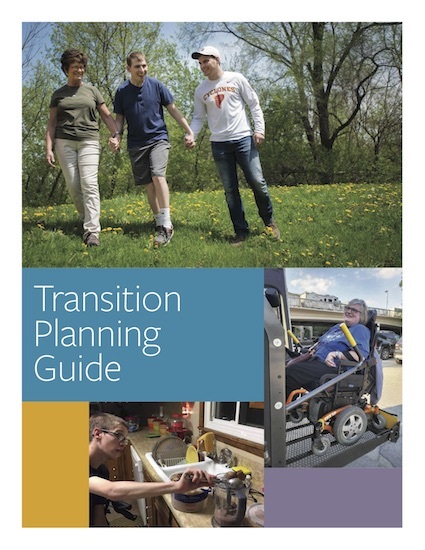 To date, more than 700 people have made the transition into the community, and more than 90% of program participants have completed the MFP transition year, before successfully transitioning to the Brain Injury or Intellectual Disability waiver. Click on the poster to download a pdf for a better look. Four individuals who have made successful transitions to community living through Money Follows the Person share their experiences in a brief video below, titled "Partnership for Community Integration." In the video, they share stories about their new homes, jobs, and activities; their challenges and achievements.